Before the lesson, have the children draw a caterpillar and a butterfly. Collect the drawings. Once you have gone through the lesson below, offer the children another piece of paper and ask them to draw a caterpillar and butterfly again. Compare the two. Have their drawings changed now that they have examined the anatomy of caterpillars and moths? Do they see details that they weren't aware of before? Try to find a smooth caterpillar like this tobacco hornworm (some of the fuzzy or spiky ones have stinging hairs, so don’t pick up those.) Gently coax it onto a leaf or stem where you can observe it with a hand lens. 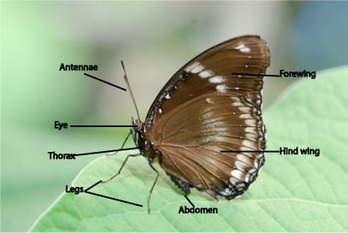 See if you can find the following organs and structures. 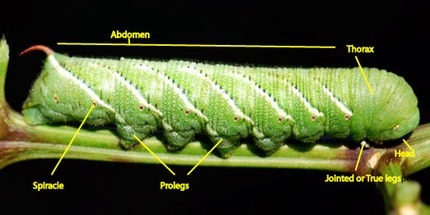 In this side view of a moth caterpillar, we can see the thorax (the three segments right behind the head), and the abdomen quite clearly. The thorax is where we find the six true legs, which are the identifying characteristics of insects. What are those fleshy appendages on the abdomen, aren’t those legs? From a scientific perspective, those are not true legs, but are called prolegs. They are used for walking and clinging to leaves just like legs, but they lack the joints of a true leg. As you will see, the adult will have only the true legs. 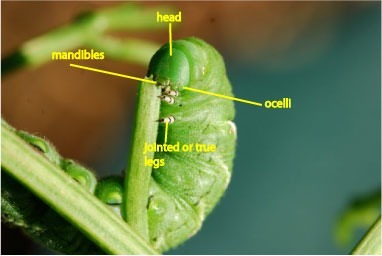 The small circles on the sides of the caterpillar are spiracles, the openings through the insect’s exoskeleton that allow it to take in air. 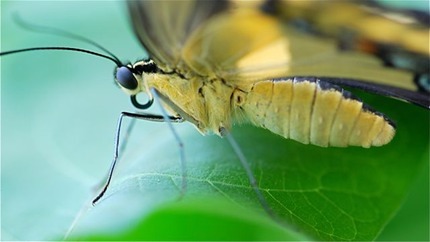 In this view, we can see the caterpillar’s head. At the bottom of the head are the mandibles, the pruning scissor-like jaws that it uses to cut food. Slightly above and to the side of the jaws are the ocelli, which are simple eye spots. The caterpillar probably doesn’t see much with those tiny spots, maybe only whether it is light or dark out. This photograph shows a better view of the jointed legs. Can you find the mouthparts and the spiracles on the body of this giant swallowtail butterfly? What about the compound eye?